The home search that follows will allow you to browse the current Active & Pending MLS listings of homes for sale in the South Austin Rancho Alto subdivision. If you want further information on a specific home, or want a NO Pressure tour of Rancho Alto Homes, call Jim at 512.913.1557. Location: The Rancho Alto subdivision is located in South Austin a couple of miles south of W. Slaughter Lane on Frate Barker Road. Access to the subdivision is from Brodie Lane or from Manchaca Road via Frate Barker. Residents can also enter via a back way from FM 1626 at Rancho Alto Road. The neighborhood is located on the south side of Frate Barker across the road from the Olympic Heights subdivision. 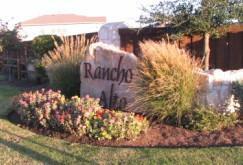 Scroll down to view more info on Rancho Alto. Click link to see featured neighborhoods Southwest Austin (West of Brodie Ln) or Southeast Austin (East of IH-35), with an interactive Google map. The table of data below show the Rancho Alto real estate market activity over the past 8 years. Rancho Alto is appealing to many homeowners, because homes in this neighborhood are more affordable than in some South and Southwest Austin subdivisions. Ranch Alto Subdivision real estate market data from the Austin Board of Realtors, 1/1/2011 - 12/31/2018. D.R. Horton Homes and Meritage (Legacy) Homes began selling homes in Rancho Alto in the year 2006. In May 2011, the construction of approximately 407 single-family, 1– and 2-story homes homes was completed. There are around 20 different floor plans that provide family living space from just above 1,250 sq. ft. to over 2,800 sq. ft. These homes have many great features including, r-38 insulation, granite kitchen countertops (most homes), cultured marble bathroom countertops, and tile floors in wet areas. Affordability: Rancho Alto has been one of the best-selling neighborhoods in this area. Why? It fits the budgets of people who want to live in South Austin, but cannot afford homes in other communities like Shady Hollow or Bauerle Ranch. Tax rates for Ranch Alto residents are typical of most neighborhoods that are located in the City of Austin. Rancho Alto is a pretty neighborhood. Some homes in the newest section have a Hill Country view. The neighborhood has only a small community park on O'Callahan Drive. The park features a playscape and swing set for children and a picnic table for family outings. The neighborhood is near schools and plenty of shopping, including the new Southpark Meadows shopping and residential development at W. Slaughter Lane and I-35 in South Austin. Other close-by shopping includes Shady Hollow Village and Tanglewood Village, both on W. Slaughter Lane. Students living in the Ranch Alto subdivision attend nearby schools operated by the Austin Independent School District. Be sure to check with the Austin ISD to verify current school assignments for the Rancho Alto subdivision.